As I was uploading Office 2010 Pro Plus (from the Office 365 subscription), I noticed that Office 2010 Service Pack 1 was not part of the update. At first this struck me as a bit odd, considering that you would normally want the users to receive the latest version of the software, but after some consideration, I decided it’s the better approach to only distribute the RTM version. Why was this? There are several reasons I can think of immediately, possibly more once I’ve had time to think about it some more. What if the users only need Office 2010, not Office 2010 SP1? Does integrating the patch save any time? 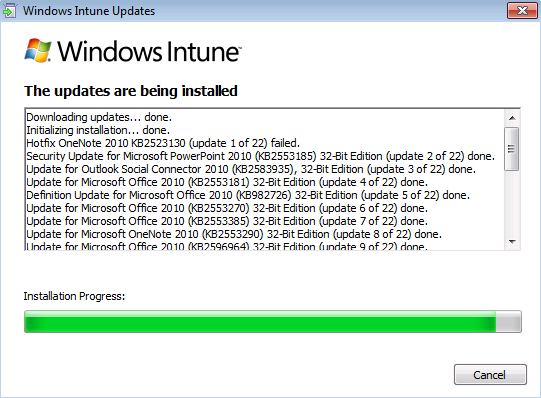 Office 2010 doesn’t slipstream the SP1 bits into the existing install, instead it runs the new updates after the initial installation from the Updates Folder. 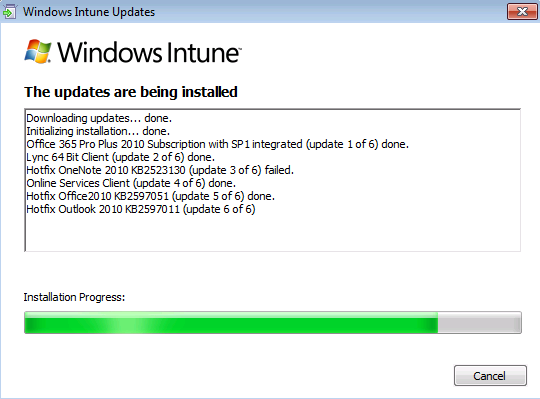 This may minimise the delay between when SP1 gets applied, but it is still running the full SP1 installation. Does integrating the patch save any bandwidth? As far as bandwidth savings are concerned, making a large, monolithic install could have negative bandwidth implications. What if some of the clients already have Office 2010, and have done the SP1 update via Microsoft Update, and it’s already cached in your local proxy server? The monolithic package can’t take advantage of that, because it’s a different encrypted, compressed file. Does this have an impact on future updates Microsoft releases? It’s fairly safe to assume that there will be an Office 2010 SP2 at some point in the future. If we assume that the way to update the RTM install files to SP2 is to once again drop them into the Upgrades folder, do you want to go through this package and upload process again, or is it just easier to approve the updates via Windows Intune and let Microsoft’s distribution servers provide the files? That’s pretty easy if you ask me, just leverage Microsoft’s work, don’t reinvent the wheel. Is it using my precious online storage for no reason? The 20GB allowance that is currently provided with a Windows Intune distribution may be more than enough for some companies, but nowhere near enough for others. Before you start purchasing additional online storage, does it make more sense to remove bits that can delivered in smarter ways while leveraging Microsoft’s infrastructure. What about integrating hotfixes that may not be available from the Windows Intune update service yet? Again, keep them as separate packages. Once they go live, you can remove them from your managed software list easily. Decide on an easy to follow naming scheme that will allow them to be recognised easily. Previous Previous post: Just how effective is TMG as a caching solution for Windows Intune and Office 365?